THE UK government is planning a “relentless” offensive on the impact that Scottish independence will have on household finances as the marathon campaign marks 500 days to go until the referendum. Scotland on Sunday understands that the UK government intends to publish three detailed papers in the next few weeks and months, with the first set to focus on mortgages, financial services and pensions and how they might be affected by independence. The move comes as Better Together leaders claim today that Alex Salmond has made a “big strategic mistake” by launching the Yes campaign without having published his own full plans on inde­pendence. A Scottish Government white paper on the SNP’s independence prospectus is not due until November. SNP figures yesterday denied the claims, pointing to the detailed work of the government’s financial experts on how a newly independent country might operate. They also claim the UK government is dodging talks on co-operation after a Yes vote, which might give people more clarity. The fresh push from UK ministers comes at the end of a torrid two weeks for the pro-independence campaign over the question of what currency Scotland would use, following a warning from George Osborne that the UK government may not want to co-operate in a new sterling zone. 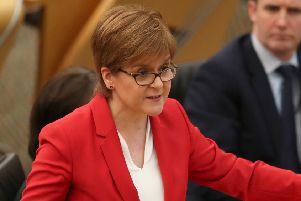 The First Minister has backed keeping the pound, but other pro-independence supporters have said they would favour an independent Scottish currency to allow a new country more room for flexibility. Today, the Better Together campaign hopes to focus more pressure on the Yes campaign by publishing 500 questions on independence on unresolved issues, including Europe, defence, broadcasting and passports. Meanwhile, Whitehall sources said they now intend to move attention away from big macro-economic issues such as the currency and to focus on the personal financial concerns of families. A further 10 papers in other areas, such as defence and welfare, are also planned before polling day. In an interview with Scotland on Sunday, Blair McDougall, the campaign director of Better Together claims that Salmond has allowed the pro-UK campaign to set the agenda. He claims that the SNP has sought to “close down” issues such as EU membership and the currency, rather than acknowledge options and uncertainty, but in so doing they have “caused themselves trouble”. Meanwhile, also interviewed today, the Yes Scotland campaign team insist that the currency row has not affected the campaign, and insist that the polls are failing to pick up a shift in the “tectonic plates”, as people weigh up the options available to them. Marking the 500-day milestone today, Deputy First Minister Nicola Sturgeon argues that “only independence” will ensure that the gap between the richest and poorest in society will be closed. The referendum will take place, in 500 days time, on September 18, 2014.